Whether you are looking for a career coach to help you build your business, find your dream career or choose the right college major, there are so many things to consider when choosing a coach. The major things to consider are the life coach’s education and certifications, the life coach’s specialty, their approach and perhaps even their age and gender. Below are a few factors that will help you find a life coach that is well-suited for you and your needs. Browsing the internet for life coaches can yield so many results, most of which will certainly not be a good fit for everybody. Depending on the reasons for which you are seeking a coach, you’ll find a variety of coaches that specialize in anything from career, business, leadership, entrepreneurship and much more. It is often wise to determine which areas in your life you find yourself to need the most help in. If you need help polishing your resume and cover letter, look for a coach that has experience in this area. If you’re a millennial deciding on a a college major, look for a coach who works with that specific niche. It is usually not wise to work with a life coach that will claim to be able to help you in “all” areas of your life. 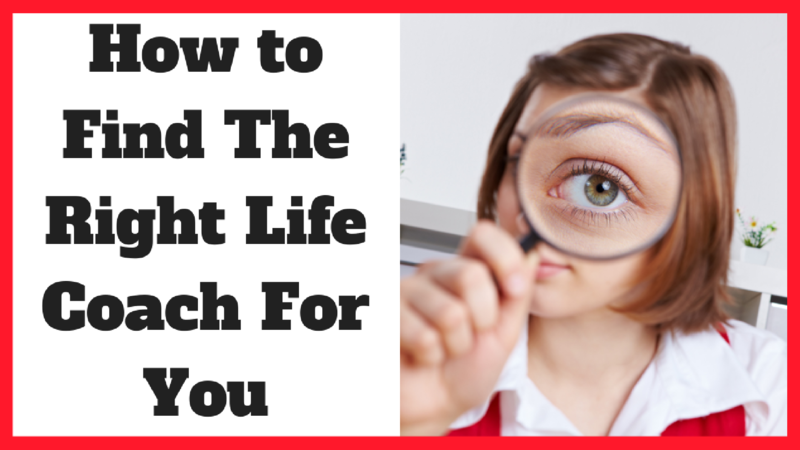 Focus on where you need help and find someone who specializes in that specific area. Do you need someone to help you find your dream job, get that promotion or start your own business? There are life coaches everywhere nowadays. Some have studied online, while others have had a formal education and hold higher degrees. When searching for a life coach, you have to ask the coach about his or her education, certification and experience so you feel confident in that person’s ability to help you. Many people simply claim to be experts in their fields or label themselves as experts on their websites, for instance, but lack the credentials that make up a genuine life coach. If you feel that the case might be such, don’t hesitate to ask about the person’s credentials, certification, training, education and overall background. Many people who claim to be life coaches might not be able to tell you who trained them or where they where certified and might have only taken a few courses before claiming to being life coaches. Although gender and age don’t always play a big role in the decision making process when finding a life coach, it can sometimes be a factor. For instance, a younger person might prefer working with someone in the same age range. As for gender, for certain people, there is a preference for a life coach with a gender that eliminates the factor of attraction and thus distraction. For others, gender is not a determining factor. If you have specific preferences, you can get a recommendation from Noomii and be paired up with a coach that suits your specific needs. Different life coaches take on different approaches when dealing with their clients. Think about what approach might be best suited for you before committing to a certain life coach. If you aren’t sure what coaching style would suit you best, Noomii is a great resource for this information. Also, the ability for you to get along with—and thus benefit from—a life coach can greatly depend on whether your personality and personal traits allow you to have a certain chemistry with the life coach or not. There’s nothing wrong with talking to different life coaches until you feel comfortable and happy with your decision. If you ask for a recommendation from Noomii, you will be matched up with up to three coaches, giving you options to choose from. Certain people might find it more convenient and/or economical to have a one-on-one life coaching session with their life coach over the phone while others prefer to have the sessions online. Still, certain people might prefer to have their life coaching sessions face-to-face. There are advantages and disadvantages to each one of these methods. The chosen method will depend on both the client and the life coach’s preferences and convenience. Finally, there is an abundance of life coaches available out there. Choosing the right life coach for you might seem like a daunting task at first, but with the right research and planning, you can end up working with a life coach that is best suited for you and that will, in turn, help you grow and reach your desired career goals. Keep in mind though that life coaching is not a substitute for therapy or health counseling. Also, a life coach is not supposed to do any work for you, or tell you what to do for that matter, but rather help you find your own path to your desired goals. Rana Tarakji is an American-Lebanese female entrepreneur, digital marketer and contributing writer at Life Coach Spotter. After having worked in several hyper growth startups such as Groupon - Rana launched and eventually left an internet startup called Cary, a pre-owned marketplace mobile app based in the United Arab Emirates. Rana has since then been focused on her online shop Stylerail, as well as on freelance writing, and has had articles published on dozens of respected websites and blogs.